The Ted and Grace Bachhuber Aquatic and Fitness Center (TAG CENTER) is a 46,000 sq. ft. facility, built in 2002 and given as a gift from the Bachhuber Foundation. This beautiful facility is located on a spacious 40 acre site on the West Side of Mayville, Wisconsin. It is under the operation of the City of Mayville, Department of Parks and Recreation. 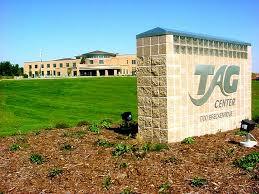 The TAG Center provides a safe and comfortable environment for indoor recreation regardless of weather conditions. It is a facility for all age groups that offers opportunity for recreation, education, fitness, and social interaction. The Indoor Aquatic Center has a water-park like atmosphere. Included are a 228 foot long tube slide, interactive play areas, three lap lanes, and a current channel. A state of the art advanced ozone water treatment system requires the use of less chlorine, thus improving both water and air quality in the Aquatic Center. A Fitness Center equipped with the latest in cardiovascular and resistance machines along with a free weight area is another major feature of the building. A gymnasium, with a suspended walking and running track provides another exercise outlet for guests. Two community rooms are available for rent and provide a great place for that special party. A relaxing, casual lounge area provides an opportunity to socialize with friends and family. Donors to the TAG Center Endowment Fund are recognized on a stained glass mural that is a beautiful work of art constructed by local volunteers and is a part of the lounge area. The TAG Center offers grand views of the surrounding countryside, and has an open, airy, expansive feel, with glass, wood, and fieldstone enhancing the hallways and adding a rustic touch to the exterior. The TAG Center provides a safe and comfortable environment for indoor recreation regardless of weather conditions. It is a facility for all age groups that offers opportunity for recreation, education, fitness, and social interaction. For more information visit the Tag Center's website. Some positions come with a FREE TAG Center Membership!